Although I had a wide choice of Asian restaurants near the University of New Mexico Campus for lunch on Saturday, a tight time schedule caused me to go to one of the places that was most visible and which involved the least travel. 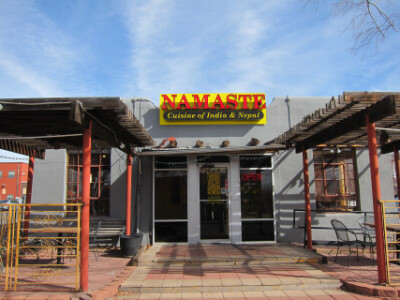 Namaste turned out to be an excellent choice both for the food and for quick service. It also allowed me to sample a cuisine I had never tried before, namely Nepali (served here in addition to Indian food). Albuquerque seems to be a hotbed of Asian food, and I know from both Yelp and Gil’s Thrilling and Filling Blog that many of them are ones I want to try. 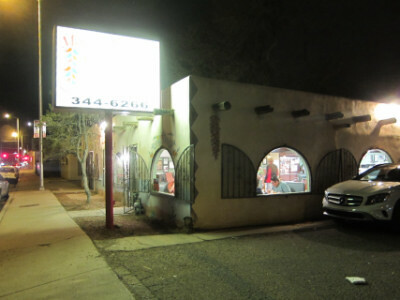 Many of the best ones seem to be near UNM and along Central Avenue, and hopefully I will be able to make other trips to sample their food as well. The main downside to Namaste seems to be the logistics of going to it. There are a few parking spaces behind the building along the alley that are reserved for restaurant customers, but if they are full I think people may be out of luck as far as parking is concerned. The restrooms are down a flight of stairs in the basement so it looks as if the restaurant is not accessible, but I do not know if they have other arrangements. At first I was tempted to try the Indian buffet which they have on Saturday, and the price was right for this. On second thought, though, I saw some Nepali items on the menu and ordered one of these instead. I cannot give a full report of the food served here, but I was very satisfied with what I got. Chow Chow was one of about six items available from the Nepali menu. My choice was affected by the fact that it is their cheapest Nepali item and also the one that can be prepared most quickly, but I certainly was more than happy with this choice. I commented to the waiter that it looked like Chinese food, and he said it was cooked with soy sauce. It even tasted like Chinese food, which to me was a very pleasant surprise. I have had many Indian style “Manjurian” Chinese dishes which were spicy and had mostly Indian flavors rather than Chinese, but in this instance I was glad the Nepalese have a different cooking style. The Chow Chow was not spicy and had slightly different flavors than the Cantonese food with which I am all too familiar, yet I think it could be served at Cantonese restaurants and people would think it was authentic. On line recipes for Chow Chow indicate that it always has ginger, garlic, and soy sauce. Unlike most Chinese dishes, though, it also includes turmeric (an ingredient of many curries but this dish did not have curry). 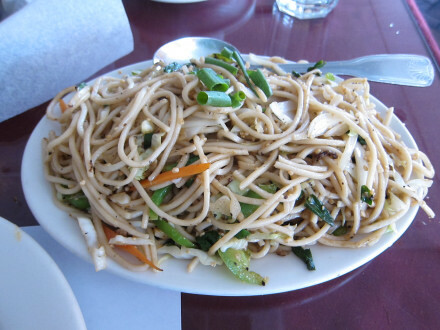 This was a vegetarian dish, and the vegetables mixed into the noodles gave it added flavor. The waiter told me Chow Chow was on their buffet on weekdays but not Saturday (the buffet looked rather small and there were only a few customers at the restaurant). For other Nepali dishes, though, I think you have to order them from the menu. Although I did not try the buffet I saw some of the items they had, and they looked good. They seemed to be predominantly meat items, and they had several types of curry and sauces. There is also quite an extensive choice of Indian food on the menu (unlike the Nepali menu which only lists about six items). For me this restaurant was a good choice–I not only enjoyed the food but it made me want to come back to try other things. The Chai was good, and is definitely what I would order if I go back. Chow Chow seems to be a simple dish which they made more complex through its flavors, and because of this I have high expectations for other dishes I might try here. There is another location in Rio Rancho (where I expect parking will not be as much of an issue). The restaurant is closed between 2:30 and 5:00 P.M.
For an in-depth review of this fabulous New Mexican restaurant I would refer the reader to the one on Gil’s Thrilling and Filling Blog. In fact, Gil’s recommendation is the reason I visited this restaurant on one of my all too infrequent visits to the Duke City. There is not much reason to go over territory already covered in his review, but I wanted to experience Mary & Tito’s food for myself. Gil proclaims Mary & Tito’s “THE very best New Mexican restaurant in the world!”, and as of now I know of nothing that could contradict this. Gil says it took him 45 visits to sample every item on the menu, while I have only tried two, but I have come to the same conclusion. As always, though, I will continue to either try to prove this hypothesis correct or find another one that could reach an even higher level of excellence. Knowing how popular this restaurant is, I was a little surprised when I saw how small the dining room was. Going on a Friday night, though (one of the only two nights it is open past 6 PM), there was a table available. The above photo was taken near closing time when the restaurant was practically empty, but I think this is very rare. 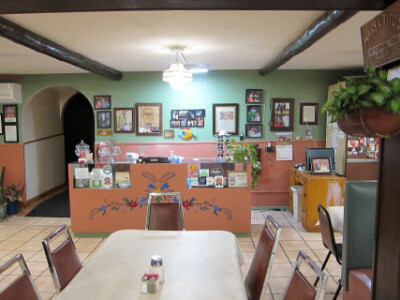 One thing to keep in mind when visiting New Mexican restaurants is that having a place this small usually means there is very good control of the food going out of the kitchen, and it will probably taste the same no matter when you visit. 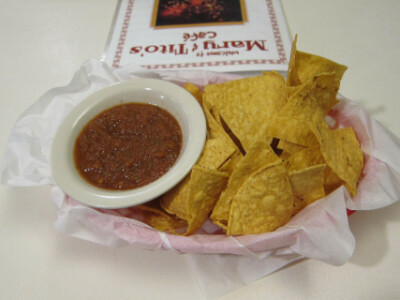 I do not have many comments about the chips and salsa except that they are excellent, and the salsa is not so spicy that it will numb your mouth before you get a chance to taste the food. Ordering Enchiladas is relatively simple here. The two things that are the most important to me are standard–the enchiladas as stacked and they come on blue corn tortillas. Neither of these are very common in Las Cruces (where I have most of my New Mexican meals), but they are things I really appreciate when traveling north. Knowing that I wanted to order red chile (on Gil’s recommendation) made it all that much more important to have blue corn tortillas, because I think this is one of the best flavor combinations in New Mexican cuisine. The only real choice involved with the enchiladas is whether you want red or green chile and whether you want it with meat or no meat (you can also get “Christmas” with half red and half green sauce). My photo is different than the ones on Gil’s blog, though, because mine is meatless (I believe all of his photos show the sauce with meat). This was frankly somewhat of a surprise to me because the meat version of red sauce is very unusual in New Mexican restaurants I have visited. Because my dining companion ordered the version with meat I was able to sample it and determine that this was the best choice, and I’m sure this will be what I order in the future. There is something about this flavor combination that goes together much like I find with the red chile and blue corn tortillas. Another unusual thing about this restaurant was the name Mexican Turnover which is usually called a stuffed sopapilla in other restaurants. If it is possible for anything to be better than Mary & Tito’s enchiladas, though, it would be this. The waiter suggested that I get the sauce on the side since I wanted to try both the red and the green, and I also ate part of it without the sauce. Eating it plain gave me a greater appreciation of just how good the sopapilla was, and having it filled with pinto beans was just the way I liked it. In a way I would say the turnover was better than the enchilada, but really this is almost an impossible choice to make. I do not have a preference between the enchiladas and the turnover, since I really liked both equally. There are several versions of each one, with different sauces, meats, etc. 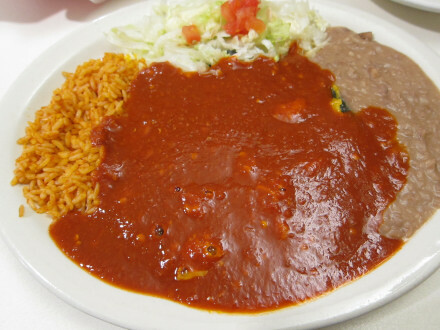 I think the best sauce is the red chile with meat, especially on the enchiladas. I thought the green sauce was also excellent, and to me it tasted better on the turnover than the red (both were plain sauces without meat). 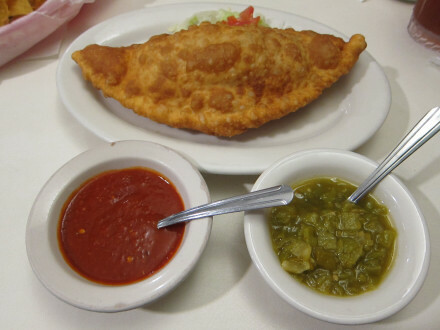 This is not a conclusive test of one sauce being better than the other, but only that with the sopapilla I think green is a good choice. The restaurant is justifiably proud of its red sauce, and the waiter explained how they used dried chiles that were then reconstituted into a sauce while adding their special spices to it. Because of this process red chile can either come out very good or very bad at New Mexican restaurants, but at Mary & Tito’s it is arguably the best. At least I think each Mexican food lover owes it to themselves to try it. It is not terribly spicy, but the emphasis is on flavor. When I took some night classes at New Mexico State University I used the opportunity to sharpen my work skills as well as do a systematic sampling of the restaurants in Las Cruces. While I had a good excuse to try many new restaurants, I also became a frequent customer at some that had already been my favorites. At the top of the list was Tatsu Japanese Restaurant operating out of a building which appeared to be a converted coffee house, but which provided a cozy setting for some great food. When Tatsu closed I thought good Asian food in Las Cruces would now be extremely limited, but it turned out that Chef Tatsu Miyazaki was really just beginning his ventures in the restaurant world. 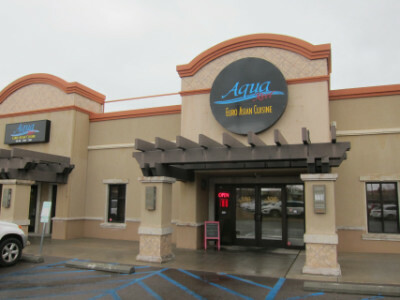 Aqua Reef, opened in 2008 on Telshor and now at the new location, continued the Japanese cuisine formerly served at Tatsu but which has now been expanded to “Euro Asian fusion.” Although I have seen the word fusion used to describe the restaurant, this is somewhat of a misnomer because the Japanese food seems to be as authentic and true to the Japanese tradition as I found at Tatsu Restaurant. 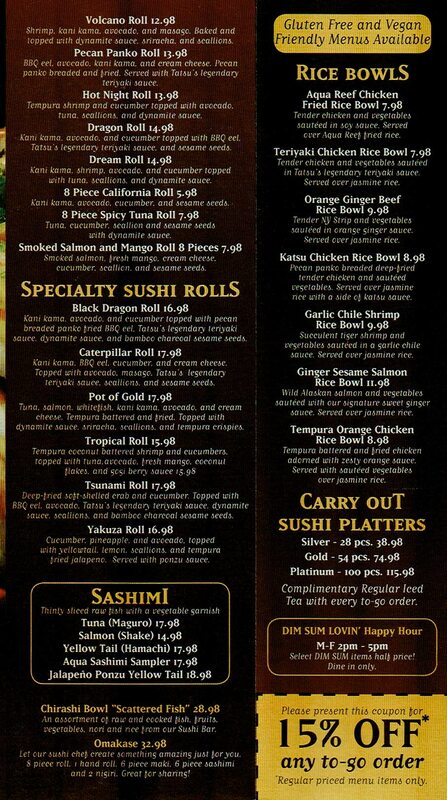 They have added other types of food to give diners more of a variety, but the heart of the restaurant is still Japanese (the sushi selection has also become quite extensive). Before I give my observations about the food I probably need to address the issue of the prices. It is expensive for Las Cruces, but the food is from a renowned and much awarded chef–the type of food you might expect to get in places such as Las Vegas (in fact Chef Tatsu was a chef instructor at the Cordon Bleu College of Culinary Arts in Las Vegas). Aqua Reef does not have lunch specials and it is more expensive than other lunch choices for sure, but I think it is far less expensive than similar food would cost in larger cities. This is a special occasion restaurant, but the prices are such that you can enjoy the “special occasions” much more frequently than you might think. My natural inclination is to try to save money, so I had to make a choice here about what to order. Salmon is usually my preference for Japanese lunches, but it is more expensive than other items (and other choices such as chicken were already more expensive than at other restaurants). Once I decided to get what I really wanted (the salmon), I also had the choice of their regular tea or an upgrade to the Té brand (this was recommended by the waitress). I will just get to the point and say I think it was a good choice to go with the more expensive option on each one, and I think my money was well spent for the experience I had (the lunch was about $20 for both food and drink). My opinion is that it is well worthwhile to splurge here. If you want something less expensive such as the chicken, that is worthwhile also, and was my go to dish at the old Tatsu Restaurant that I enjoyed so much. This does not have to be your most expensive meal in Las Cruces, but if you choose to spend the money you will get a very good meal. 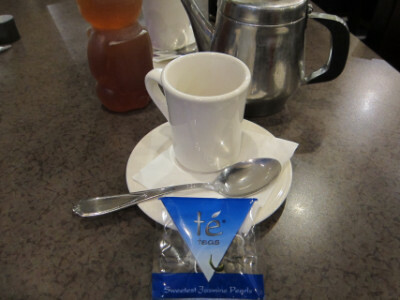 The Té brand tea is an upgrade from their regular tea, and costs about a dollar more. Since I did not try the regular tea it is hard to compare them, but I was very happy with the tea I got. The bag is full of loose leaves which you dip in the teapot. The result is a brewed tea that you make yourself (and the leaves stay inside the bag). 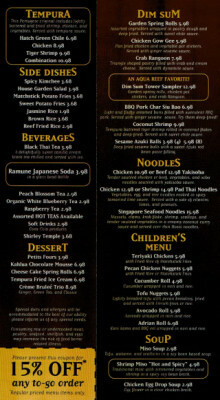 They have several flavors of tea, some of which would go better with the “Euro” side of the menu. 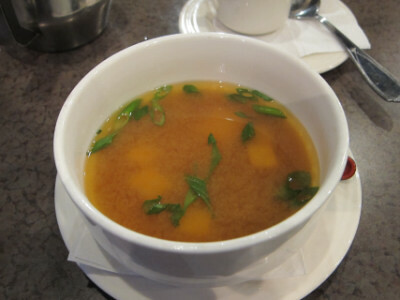 My meal came with a choice of miso or egg drop soup, and of course I thought the Miso would go better with a Japanese meal. The miso was so rich and flavorful it made me think that many others are actually watered down, and that this is the way they would do it in Japan (it probably is, but all I can say for sure is that it is quite good). The restaurant does not have lunch specials, but a number of items are suitable for lunch (assuming that you are not trying to get a very large meal). The Bento Box is what I usually like to get at Japanese restaurants because of the fact that there is a variety of items. 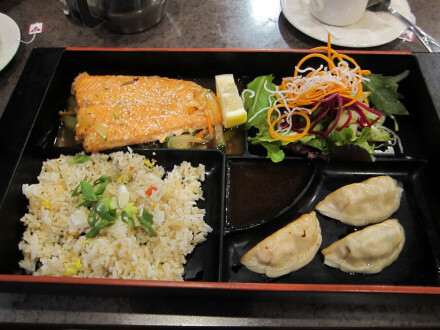 Salmon Bento Box is the most expensive of the choices, and is the one I ordered. I was happy that they had a generous substitution policy, and one that I made was to get pot stickers instead of the spring rolls that come with the order. I think this was a good choice, although I imagine the spring rolls are quite good as well. The salmon normally comes with a ginger sesame sauce which sounds very good, but I made a substitution here as well. When I saw “Tatsu’s legendary teriyaki sauce” listed for another item, I requested that this be substituted for me as well. 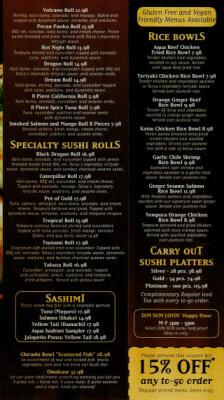 This was my tie back to the old Tatsu Restaurant, although I do not recall ever ordering salmon there. The only thing that surprised me was that the sauce was even better than I remembered, and was far more complex and flavorful than I normally find with teriyaki sauce. I thought perhaps the restaurant made a mistake and gave me the ginger sesame sauce instead, but it did not taste like sesame and I do not think Aqua Reef is the kind of place to make mistakes like that. The other thing that surprised me (in a good way) was that the salmon was actually red in color. The menu said it was wild Alaskan caught salmon, and the flavor was consistent with this, so the color was not a surprise once I started eating it. The portion size was not huge, but it was pretty substantial compared to the others I usually get in a Bento Box. 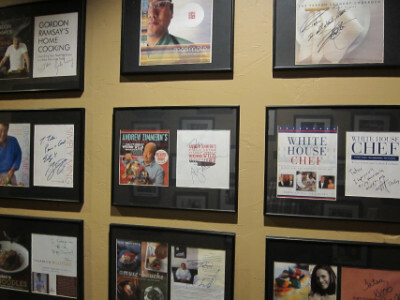 There is a wall in the restaurant displaying some of the awards and recognition Chef Tatsu has received, and the food fits with the type of information I saw. 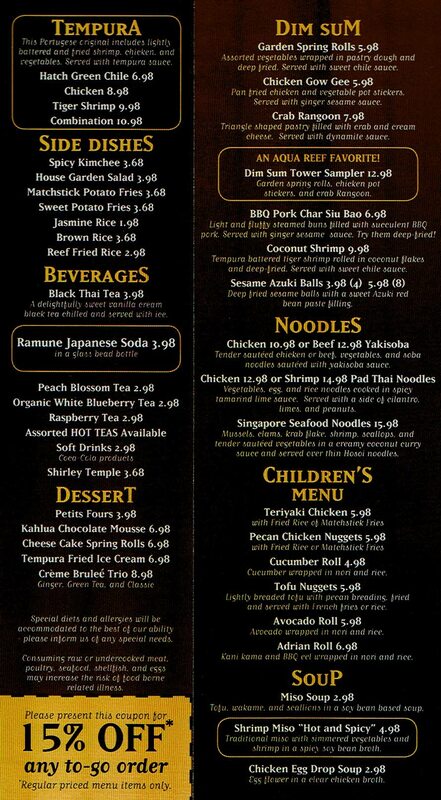 I read on the Internet that Chef Tatsu recently began management of the Restaurant at Sierra Grande in Truth or Consequences, and he has had several other restaurants in Las Cruces and other cities. I do not know him personally, but I think he must have special pride in Aqua Reef because of the fact that it is primarily a Japanese restaurant. The only other comment I want to make is the fact that I have seen mixed reviews of Aqua Reef which held me back from trying it earlier. I am sure many of these people had valid points, and any restaurant is going to have some who like it and some who do not. It is expensive for Las Cruces, but after visiting many other cities I think Aqua Reef is a very good value for what you get. To me the restaurant was not just trying to be upscale, but it was genuinely good and really delivered what I want in a upscale meal. At the same time, though, it was still casual and down home, and made me feel like I was at the old Tatsu Restaurant.